As the 2016 season comes to a close, a number of players will hang up their cleats and put their playing days behind them. This week I’m rewinding 40 years to the late career and retirement of one of baseball’s greatest players. The MLB foul ball week in review shows that Major League Baseball ended the week of September 19 – September 25, 2016 with about 164 Foul Ball Facials in 168 days of games. These are only those fans hit in the head area at Major League Baseball games as self-reported on Twitter. That equates to one fan per day of play. It seems like a lot, and it is, but it could be fewer because just over 40% of these tweets indicate the fan wasn’t paying attention. To put that into perspective, it means roughly 45 fans (conservative estimate) would have avoided foul balls to the face had they not been buried in their phones. So many people assert there’s no time to react to a baseball hit at them. Granted, this one did bounce, but it was still going at a good speed. This young man saved the fan next to him. And that guy covered his face with his arms. Plenty of reaction time since both were paying attention. Did you catch this Eduardo Munez catch? The guy hauled it from 3B to snag a ball Buster Posey lost in the lights. Amazing. The Cleveland Indians Are the 2016 AL Central Division Champions! tonight, on September 26, after beating the Detroit Tigers in Game #156, the Cleveland Indians clinched the American League Central Division and secured their spot in the 2016 postseason AL Division Series! this is their first AL Central Division title since 2007 and eighth title overall in club history. who do you want to see the Indians face in the ALDS? how far in the playoffs do you think they’ll go? leave a comment with your preferences and predictions! The week in review: The Milwaukee Brewers were at home this past week to face the Pittsburgh Pirates and Cincinnati Reds. The Pirates went to work with wins by scores of 6-3 and 4-1. The Crew salvaged the series with a 3-1 win, and then took game one of the Reds series by a score of 5-4. Cincinnati won the two remaining games to close out the weekend. Going into Monday’s action the Brewers are still in fourth place in the NL Central with a 70-86 record, 29.5 games behind the Chicago Cubs. I predicted a 71-91 record this year. With six games left I hope they win a few more and prove me wrong! What happens to the Marlins now? 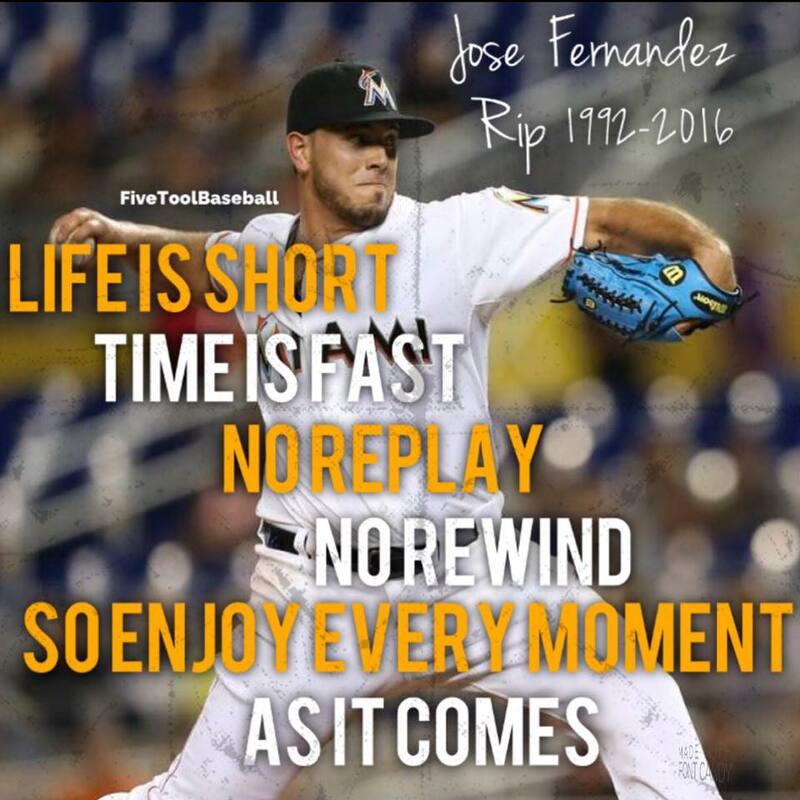 The passing of Jose Fernandez has come as a great shock and a huge blow to the baseball community. Teammates, coaches, competitors, and fans have all been at a loss for words after the news broke yesterday. I too have just been in a little bit of a daze. I never met Jose, never watched him play in person, but he was a part of the baseball community/family. Baseball brings strangers together, and when a talented player, and by all accounts amazing person, dies way to young it affects the entire baseball family. Read the rest of What happens to the Marlins now via 9 Inning Know It All. The Winter League helps players work on their weaknesses, their game plan and do so facing more advanced levels of competition. It also has the obvious benefit of helping stay in shape. For many these factors assist them to get to spring training with a more distinct advantage over those that stick to the gym and home based development work. The competitive level in these league don’t allow managers to treat this tournament as development leagues since they are there to win, we have seen times with four different managers in a season including switching managers in Playoffs, even in Finals!